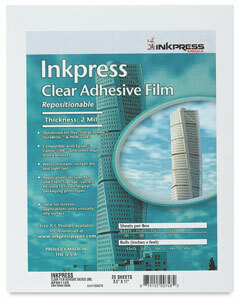 The Inkpress Adhesive Clear Film is compatible with all inkjet printers, is 2 mil thick, and adhesive-backed. This clear, polyester film can be attached to almost any indoor or outdoor surface. Water-resistant, lightfast, and fade-resistant, it comes in three sizes, 20 sheets per pack.